Whether you prefer your wings with traditional Buffalo sauce or in wild flavors like IPA mustard and rosemary, there’s no shortage of pubs and dives to eat spectacular wings in Nebraska. We’ve put together 9 of the best places to get your fix of tasty chicken wings in Nebraska—check ‘em out! The Chicken Coops Sports Bar is a unique combination sports bar and microbrewery located in downtown Grand Island. They dish out delicious, tender chicken wings that fall right off the bone. What come could one ask for from a plate of wings? The Isles Pub and Pizza in Lincoln has delicious wings in incredible flavors such as buffalo, Thai, and garlic parmesan. The relaxed, fun atmosphere, good music, and friendly staff will keep you coming time and time again when you have a craving for delicious wings. For tasty wings in a historic, old-school tavern, stop into Murphy’s Wagon Wheel for your fix and amazing sauces. Crispy on the outside and tender on the inside—Murphy’s knows exactly how wings should be. For beer and wings, the Crescent Moon Ale House is the place to be. Stop in for “Wing Fling” nights and order amazing wings that are partially baked then fried on demand in delicious flavors such as inferno, Buffalo, and barbeque. Vegan wings are hard to come by in Nebraska, but you can find them at the Benson Brewery in Omaha. A mixture of wheat gluten, salt, yeast, and poultry seasoning makes these delicious wings an excellent meatless option. For the real deal, try the charred brew wings in spicy, barbeque or IPA mustard flavors. 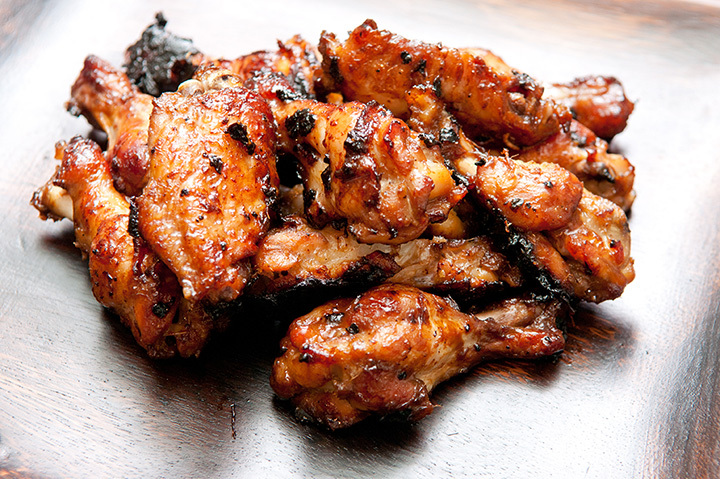 For delicious barbeque-style wings, make a stop at the Hickory Road BBQ & Catering Co in Lincoln. Try the perfectly smoked, flavorful wings with a side of mac and cheese or baked beans. They’re out of this world! At Pitch Coal-Fire Pizzeria your order of wings comes with all the dipping sauces you could ever need and cilantro and caramelized onions on top. From herb coal-fired to rosemary chicken wings, every plate looks almost too good to eat! Your taste buds will be in heaven at the Southwest Pit BBQ in Lincoln. Dive into a delicious order of chicken wings that fall right off the bone and are covered in extraordinary barbeque sauce. Picasso’s Pizza in Omaha is the definition of a hole in the wall. However, don’t let that discourage you from making your way over for excellent chicken wings with just the right amount of sauce. This classic pizza and wings joint is consistently good and reasonably-priced.